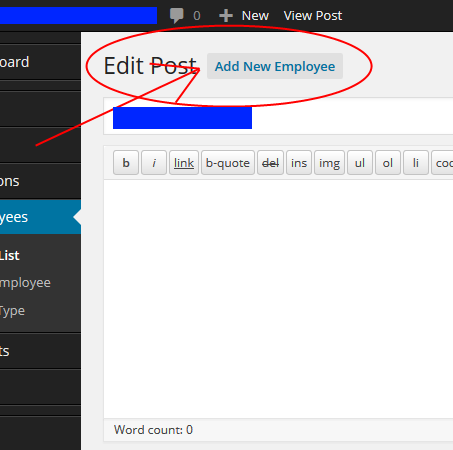 I'm customizing the backend of a WordPress installation for a client, and I've added several custom post types. They are displayed on the front-end via a custom loop inside one page, so users shouldn't access the individual custom posts. I'm looking for a WordPress hook to place the button there, but I haven't found anything yet. The closest I found was a post on the WP Core blog (citing edit_form_advanced, edit_form_after_editor, edit_form_after_title), but none of the ones listed will work for this. Really though, all I need help on is finding a way to hook it in. I know what to add once I find out how to add it. That code (pasted to functions.php) will dynamically add new link tag after "Add new" link. The problem is that Add New (post type) is wrapped inside an <h2> tag (line 365 of the same file) and the hook happens after it.